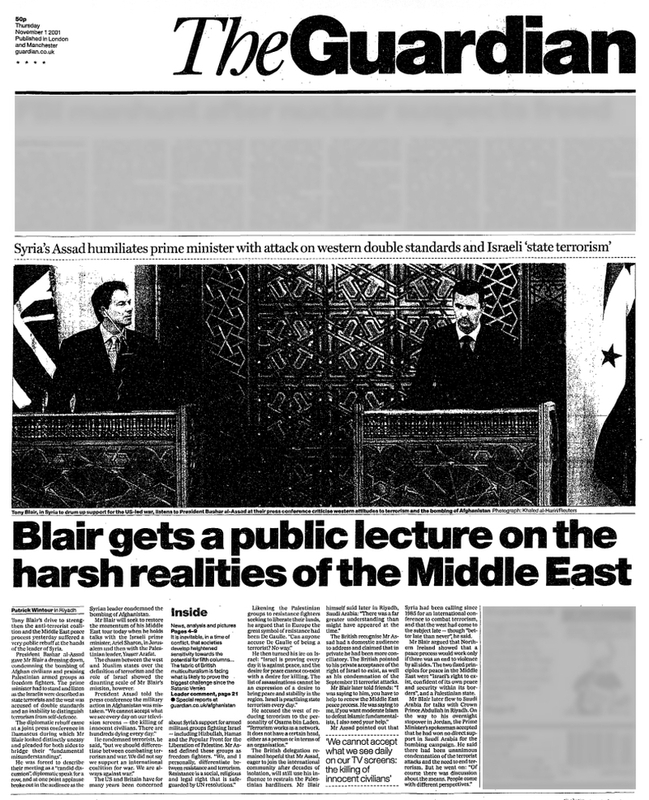 Reading the transcript of a joint press conference by Syrian President Bashar al-Assad and British Prime Minister Tony Blair, which was held on the 25th day of the Anglo-American-led invasion of Afghanistan, makes it abundantly clear why another Anglo-American-led genocidal war had been launched against Syria nearly ten years later. Some people say that achieving peace will make a big step for combating terrorism, this is correct. But also combating terrorism in Israel would help to reach (5 second break in audio) highly appreciate what I have heard from Mr Prime Minister, because of his high appreciation and his great respect to Islam as a religion, and his high respect to the Muslim people in Britain. I am going to leave the floor to Mr Prime Minister to address you. PRIME MINISTER BLAIR: Mr President, first of all can I thank you for hosting me here in Syria, and say how much I welcome the talks that we have had this morning and I know we will continue later. And as you said right at the very outset this is candid dialogue. But it is a dialogue I would like to think could be pursued by us both as people trying to reach an understanding of each other’s perspectives. And trying to work together as partners for the greater good of the wider world. And there are two main issues obviously that we discussed. The first was the attacks of the 11 September in the United States of America. And I very much welcomed the strong statement of condemnation that you have made to me, and repeated again now Mr President. I think that is important that the entire world knows that the world community is united in condemning what happened on the 11 September as an atrocity. The second thing is that that attack was carried out by extremists who do not represent in any way, shape or form, the true faith or voice of Islam. And your strong statement to that effect is also most welcome. I believe it is important therefore that we send out a very clear message and signal that there is a strong international coalition against terrorism. And in Syria, and indeed the countries in this entire region are united as part of that coalition. In respect of the Middle East peace process, whatever the differences of perspective, we both understand the importance of restarting the Middle East peace process properly, of getting back to a situation in which differences are resolved by a process of talking and dialogue. And that in that regard violence from whatever quarter is equally unhelpful, and what we require is the space and the time to get people talking together again. And the objective that we seek, and I believe again this is shared by you, and shared by people in this region, is a situation where Israelis and Palestinians can live side by side in peace together. That is in the end the only possible long-term solution. So Mr President I thank you for inviting me here today, I have very much welcomed the talks together. I know that for you as you were saying to me earlier, there is a relationship not just between Britain and Syria that is part of our history, but a personal relationship for you, since you have lived and worked in Britain. And I hope that the candid dialogue that we have begun today can strengthen over time. Because there are huge differences in understanding between West and Islam, between west and the Arab world. And yet if one can come out of the terrible events of the 11 September, it is an attempt to bridge that gulf of misunderstanding, and create the right circumstances for partnership in the future, and I believe that that is possible. And so I hope that the dialogue we have begun today can continue over time, so that we achieve the objectives we both want to achieve. Which is an end to terrorism in all its forms, wherever it exists, and a proper and lasting peace and solution for the province of the Middle East. Thank you. QUESTION: Could I ask (inaudible) if they discussed the current action in Afghanistan during their talks? Whether any pledges, promises, guarantees, anything of that nature were sought by President Assad, and given or not by Prime Minister Blair. PRIME MINISTER BLAIR: Well of course we have discussed the current situation in Afghanistan. And I think that the most important thing to emphasise is that people accept that what happened on the 11 September was wrong, and that it is necessary for the international community to act. Now we are acting in Afghanistan, we have set out our objectives there very, very clearly. And I think that the desire of everyone is to make sure that we bring that action to a successful conclusion as swiftly as possible. That is our desire I think that is the desire of all people in this region and elsewhere. PRESIDENT ASSAD (via interpreter): As far as we are concerned in Syria we (inaudible) appreciate that we announced our stand right from the beginning. A very clear stand that we condemn terrorism, and with an international coalition for combating terrorism. But we should differentiate between combating terrorism, and between war. We did not say we support an international coalition for launching a war, we are always against war, it is a point of principle, because wars have always a negative effect on societies. And we believe that combating terrorism cannot be done through war, but it can be done through political cultural intelligence cooperation amongst relevant countries. And therefore, at least we do not like to see more wars taking place in the world, because we have suffered from many wars, especially as we see some civilians, innocent civilians falling every day. QUESTION: And Mr Prime Minister Tony Blair, and the American President George Bush, and your Excellency have announced your support to establishing a Palestinian, independent Palestinian state to establish the ability in the region. How do you see the execution of the (inaudible) in the light of the dangerous (inaudible) of pulling down houses, expanding settlements, and ignore all international requests, including your request, and the request of the American administration. PRIME MINISTER BLAIR: What is necessary if we are going to restart the peace process in the Middle East is that two things happen. First of all we have got to agree what the fixed points of principle are. And those fixed points of principle to my mind are that Israel is entitled to exist, has its right to exist, and be confident of its own peace and security within its own borders. And secondly that alongside the state of Israeli there is a Palestinian state where there is justice and equality for people. Now I believe that based on that, based on the United Nations resolutions, it is possible to restart a proper process that can achieve those aims. The second thing however that is necessary, as well as agreement on those fixed points of principle, is that we have an end to violence of all sorts, in order to give space and time for a peace process to begin again. Because whilst violence is continuing, of whatever nature, it is difficult for the political process to work, and if I can say to you, certainly to borrow from the process of peace in Northern Ireland, which, in a very different context, has some similarities in terms of divided communities and great bitterness and hostility, it is vital, in order for the political process to work, that violence ends, of all types, because it is the people of violence that want to displace the political process, and what I would like to see is, based on those six points of principle, based on the United Nations Resolution, a peace process begin again that allows us to take back control of the situation for politics and not for violence. QUESTION: Can I ask the Prime Minister whether you did discuss the situation of the terrorist groups which the Americans believe were operating in this country, whether you asked the President to restrain them, and may I ask the President whether you are prepared to take action against those groups, in particular the one that has claimed responsibility for the recent assassination in Israel? PRIME MINISTER BLAIR: First of all, if I can say that, as I just made clear a moment or two ago, it is our belief that all groups involved in violence must cease their activities, so that the political process is given a chance to work. Now, there are going to be differences in perspective and views about the issue, both of the Middle East peace process, about the action that we take in respect of Afghanistan. But what I think is important is to recognise that unless we can bring about the situation in which the violence really does cease in the Middle East and the political process begin to work, then it is very difficult to see how we are going to get a just, negotiated solution to the problems that we face, and as I say, whatever the differences in perspective are – and we said it was a candid dialogue – whatever the differences in perspective, I think that is accepted by both of us. We both want to see a situation where the violence ends and ends completely, on all sides, so that the peace process can get started again. 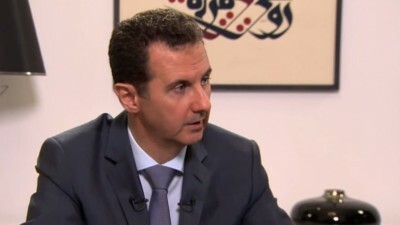 PRESIDENT ASSAD (via interpreter): I would like to give a comment about this question. Of course the issue of the Middle East issue is for the countries concerned and one of the first countries who are concerned and we are more capable to decide the nature of the organisations and the people who are in the region. As I said in the beginning, resisting occupation is an international right nobody can deny, and therefore we have many organisations, many people who support the liberation and who support the resistance fighters who seek to liberate their lands. The act of resistance is very different from the act of terrorism. As I said, we differentiate. In the west you have one example in France, for example, one of the most important personalities or one of the symbols is President de Gaulle, who fought for liberating the French land. Can any one of you accuse President de Gaulle of being a terrorist? No way, because what President de Gaulle did is the same thing that’s being done by the resistance fighters in this region, and therefore it’s the same measure that should be applied. QUESTION: Mr Prime Minister Tony Blair, the peace process was started ten years ago and peace has not been achieved at a time when violence was not there in the region, and the peace was not achieved due to the Israeli policies. Is there any initiative or intention by the Europeans or by international community to restart the peace process (inaudible) according to the United Nations Resolution and the land for peace principles (inaudible) for the region’s (inaudible)? PRIME MINISTER BLAIR: Well of course there’s an intention to do that. It’s precisely what we want to achieve. We want the process to begin again so that there is the possibility, through dialogue, of resolving the issues in the Middle East. But in order for that to happen, what is important is that there is an end to all forms of violence, where there is restraint, an end to violence, and the opportunity then to get people to talk about the issues, and over the last ten years, as you know, there have been many, many attempts to get the peace process moving ahead. Now those attempts have not yet succeeded, but my message to people in whatever part of the region I will be over the next couple of days is there is no alternative. When all the killing and the bloodshed stops, people will have to come back and try and resolve their differences through dialogue. There is no alternative to that, just as there is no realistic alternative to a situation where the right of Israel to exist, confident in its own security, and the right of the Palestinians to their own state, is accepted as the basic principles of that dialogue. Now I believe that can happen, but it needs the space and the time, as I say, to do it and even before the 11 September — sometimes I know in this part of the world it has been said that people like myself and President Bush were only interested in the issue of the peace process in the Middle East once the 11 September had occurred. This is not true. When I met President Arafat a few days ago in London, that was my eleventh meeting with him. Before the 11 September we already had the Tenet (?) Plan, the Mitchell Plan; as you know the Americans were preparing a new process in order to try and restore some momentum to the Middle East peace process. So we have, right from the very beginning, understood the importance of this issue, but we need the help of everybody, of all countries in this region, in order to get it done, and the single most important thing that will allow us to get it done is an end to violence from whatever quarter, in whatever form. QUESTION: It seems that the focus now is to implement the Mitchell Plan and the Tenet Plan to cement the shaky ceasefire between the Palestinians and the Israelis. Do you think that’s a good start? Is it enough of a start? And would you, at some point, encourage what you perceive as legitimate resistance to halt their attacks to give the Mitchell Plan a chance? PRESIDENT ASSAD (via interpreter): We have our perspective about the Mitchell Report. We did not participate in it and Syria was not consulted about it, but the failure of many attempts did not take into account the necessary requirements for the peace (inaudible) including the rights of the Palestinian people, and the people in the region have proven that our perspective, our point of view, was correct, so the right thing is that the ceasefire, agreement for a ceasefire, but it is not the terms of reference for a peace process. The terms of reference for a peace process is the Security Council Resolution and the Madrid terms of reference. When we speak about initiatives regardless of the names of these initiatives, or when we speak about negotiations, all these are the means, but the important thing is justice; justice is peace. We have to put one rule for the elements and for the objective, in order to achieve this objective. When we want to say — or let us assume that there’s an initiative, and the Palestinian citizen is going to ask, “What is the objective of this initiative? Is it to stop violence?” Stopping violence is perhaps necessary to reach peace, but it is not everything; the more important thing is what this citizen is going to achieve, what are the rights he is going to achieve when the peace process ends, when — any initiative depends on United Nations Resolutions, on Madrid terms of reference, and so directing the peace process, or the co-sponsor should be neutral, should be an honest broker, and this is what was not achieved during the last ten years, and that’s why peace has failed, and that’s why all the attempts have failed. If you don’t have the right way to conduct the peace process through the means and through the objectives we are going to meet in press conferences with other senior officials ten years from now to speak about launching a peace process. PRIME MINISTER BLAIR: I’d like to just respond to that if I might, for a moment. Sorry, let me just respond to that for a moment please. I think the President said something that is very important there, that the Tenet and the Mitchell plans are valid plans in order to bring about a different security situation and end the violence. But I agree that is the first step, it is not the end of the process. What must then happen is that we resolve the actual issues that are outstanding. And I think that what he said there too, in respect of the UN resolutions and the Madrid conclusions is also important. And I hope very much there will come a point in time when Syria is able to resume negotiations also with Israel in order to get the outstanding issues between them sorted out. So I agree with the fact that the end to violence is the context in which the key issues can be resolved. It’s not the resolution of the issues themselves. So we’ve got to end the violence and then go on to resolve those key issues. And I think that if there is agreement on that and if there is an agreement, as I say, on those two fixed points of reference – on Israel and on the Palestinian state – I think that we could start to make a great deal more progress. Sorry, sir. QUESTION: Mr Prime Minister, Tony Blair, many Arabs and Moslems feel a kind of frustration and oppression and injustice because of the non-implementation of Israel into the United Nations resolution and because of the double standards. Do you, Mr Prime Minister, have a plan, especially the European Union, to address this issue – this very sensitive issue — and which really is the source of tension in the region? Thank you. PRIME MINISTER BLAIR: Well, first of all, I want to say this very directly to public opinion here – and we should never forget, coming from my country, that public opinion in your country may be in a different place from public opinion in Britain or Europe or the United States of America – but I hope whatever part of the world we’re in we can agree on this: what happened on 11 September cannot be excused and neither can those that carried out the 11 September attack, in which, I may say, thousands of innocent people — Christians, Jews, Moslems, people of no faith at all — died. That cannot be excused on the basis of any court and, as the President said a moment or two ago, there are always people — the extremists always want to use a cause as cover for the extremist acts that they carry out. Now, it is also important — so I hope that condemnation is accepted by everyone and that no one should think that the people that carried out the 11 September attack represent, in any shape or form, true Arab or Moslem opinion. And that’s an important statement. But of course we understand that there is legitimate concern about the breakdown of the Middle East Peace Process and a desire to get that started again. And we understand that and what you have got to understand from us is that we know there is a serious issue here that must be resolved. And we are willing to put all our energy and ability into trying to resolve it. Now it’s not for me to come here and issue plans and so on but it is for me to come here and say to people very clearly, “We want to try and resolve this issue. We want to get the Middle East Peace Process started again. Give us the opportunity of doing that by making sure that the conditions in which people can talk again, and of which dialogue is the way forward, can be created.” And that’s why I say to you that the violence from whatever quarter has to end. And I understand the different perspectives there will be between Syria and Britain or between Syria, obviously, and Israel. There will be fundamental differences of perspectives. But we both, in the end, know there is no alternative but to us sitting down and working out these differences, not by violence or by terrorism of whatever form but by partnership and by trying to resolve the issues constructively. And I think that can happen. And one of the reasons for us coming here – and I say this to you again, absolutely openly – it is difficult because of the history and the differences to come here, to have a press conference such as this but I happen to believe that if anything good can come out of the terrible events of the 11 September, it is an attempt to find new understanding and a new way forward to resolve the differences that we have. Now maybe we won’t be able to but let’s at least try. And let’s at least try doing so, understanding the perspective from which the other person comes. QUESTION: Mr Prime Minister, I was very interested in what you said about the military action in Afghanistan. Are you now requesting, British Prime Minister, to stop the military action and would you go so far as to define it, in a way, as a form of terrorism? PRESIDENT ASSAD (via interpreter): We are not asking for anything and we are not a party to it in order to ask for putting an end to it but we have a perspective, we have a point of view, a general point of view about this war and about any other war. The history of Syria stretches for 6,000 years, 4,000 years before Christ, and the Assyrians were great fighters and that then since that time until no, there is a defence of Syrian territory. But there was — that Syria was never an aggressor or an occupier of any other country or killing of any innocent citizens. This is a principle, a Syrian principle. But, at the same time, we cannot accept what we see every day on television screens, killing the innocent civilians [in Afghanistan]. There are hundreds now who are dying every day. I don’t think anybody in the West accepts or agrees to that. QUESTION: (Several inaudible words) Mr Prime Minister, some voices in Europe after 11 September are asking for closing the frontier in the way of Arabs and Moslems. How do you see these races called and what are you doing towards them? PRIME MINISTER BLAIR: Well, as you probably know, just as Syria has some 2 million Christians, we have many, many Moslems in Britain. Millions of Moslems live in Europe and we defend, absolutely and totally, their rights to exist free from racism or stigmatising of any kind at all. There are many, many Moslems indeed, who live in the United States of America and I think what is important is that one of the common values that we should stand for in the aftermath of the 11 September is a complete rejection of all forms of racism, of religious intolerance, of discrimination against people, whatever their race or religion or creed. Just to say, in respect of the action in Afghanistan, we understand as well the issue and opinion here about the nature of the action we take but I would just like to say this to you: the action that we take is designed, in so far as we possibly can, to minimise civilian casualties. The action that was taken on the 11 September was action designed to maximise the number of civilian casualties. So whatever the differences again of perspective there, we too want to see this action brought to an end as swiftly as possible but it can be done at any point in time that the Taliban regime and the al-Qaida network shut down the network of terror there.